(St. Paul, MN) January 8, 2016 — The Creative Enterprise Zone: “We Make It Here” project announces its first featured enterprises for 2016: The Midway Commercial Building’s textile businesses and artisans and entrepreneurs, fashion designers, and costume creators: Collective Spaces, Tulip Design, Scoundrel’s Keep, Gina Sekelsky Studio, and KMK Designs. People passing by the storefront at 2500 University will see a pop-up public display about the Midway Commercial Building’s businesses in January. On Thursday, January 28, from 5-8 p.m., one of the Twin Cities best-kept secrets will be no longer, when this burgeoning community of textile businesses and artisans hosts the Creative Enterprise Zone’s first monthly “We Make It Here” mixer in the building. Inside the Midway Commercial Building (aka, The Triangle Building) a community of textile artists and entrepreneurs, fashion designers, costume creators and sewing students are behind the resurgence in industrial sewing and “maker” textile culture in the Twin Cities. They’re not only creating costumes for theater, dance and fantastical events (think Comic-Con, Steampunk gatherings and the Renaissance Festival), but also designing couture. They’re learning, teaching and sharing their knowledge, wisdom and insights, as well as their stitching skills and business savvy. Together, they’re making the Midway Commercial Building a hotspot for art, innovation and creativity in the textile arts. Creative Enterprise Zone: “We Make It Here” is a project designed to celebrate and promote economic development in the Creative Enterprise Zone (CEZ), Saint Paul’s recognized center of creativity and enterprise. The goals of “We Make It Here” are to build connections between creative enterprises and increase their visibility in ways that support businesses. This project is funded by the Central Corridor Funders Collaborative. Seven more creative businesses enterprises will be highlighted in the CEZ throughout 2016. 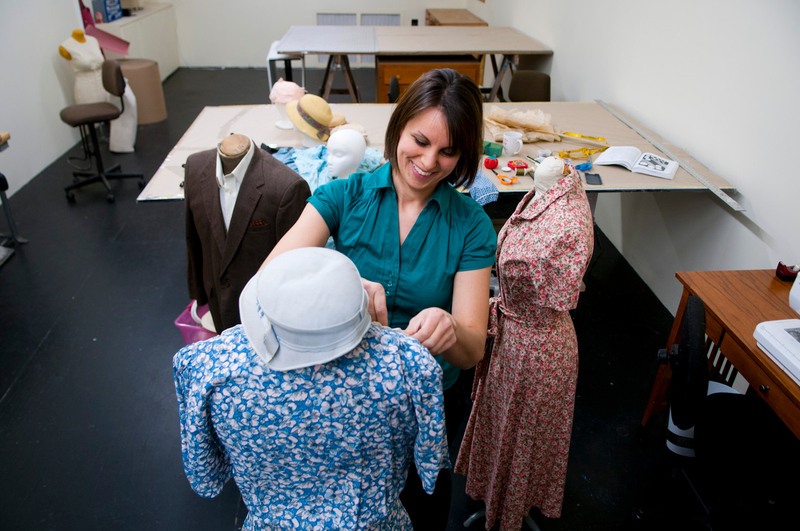 Sheila Heil of Tulip Design creates character costumes, period pieces and cosplay apparel for private clients and theater companies around the world. Also part of Collective Spaces is Judy Hornbacher, whose high fashion, functional garments are as distinctive as the distinguished women who wear her couture. Scoundrelle’s Keep creates eye-catching, innovative corset designs and dress men and women one elegant outfit at a time. Gina Sekelsky is a hand letterer for commercial projects such as magazine covers, personal communications (holiday cards, weddings, etc. ), and for fine art projects. Gina’s favorite work involves writing on fabric and hand stitching it into wearable art. KMK Designs (Sheridyn and Kaitlyn McClain) is a mother, daughter costume design business. This team discovered that through their creations they could help men and women of all shapes, sizes, and types feel more confident and beautiful. The “We Make It Here” mixer, held in the Midway Commercial Building, will not only elevate the profile of the Twin Cities sewing and textile community and its hub in the Creative Enterprise Zone. The mixer, and Kaufman’s well-lit display on the building’s exterior, will “recognize the Midway Commercial Building as a creative place with a mix of artists and businesses,” Kaufman says. Thursday, January 28, 5-8 p.m. The Creative Enterprise Zone, located mid-city between Saint Paul and Minneapolis, has the goal to be a recognized center of creativity and enterprise, a place where people make a living by their creative capacities. Learn more at creativeenterprisezone.org. Enter into the studios ofCollective Spaces to kick-off a yearlong celebration of economic and creative development in the Zone. As the first featured enterprise in the “CEZ: We Make It Here” project, they will be hosting a pop-up mixer on January 28 from 5:00 p.m. to 8:00 p.m. at Collective Spaces, 2500 University Ave. W.
Collective Spaces is a shared costume shop space that has grown into a supportive creative community that, along with several other textile artists and businesses, is making this unassuming building in the CEZ a regional hub for artistry in needle and thread. Collective Spaces is home to a multitude of artists including: Tulip Design, Judy Hornbacher, Amy B. Kaufman, Sarah Thorson, and Dunwoody students and graduates of the Industrial Sewing Program. By providing a unique and affordable space for costume makers and textile artists, Collective Spaces offers an excellent opportunity for artists to launch their own business or house an established one. They also offer sewing lessons, and are looking for new ways to contribute to and connect with the surrounding community. With the aim of growing this burgeoning textile community, Collective Spaces is the first featured enterprise in the “CEZ: We Make It Here” project, which will highlight a new creative enterprise in the Zone every month in 2016 through August. As part of the project, they will also unveil a unique textile display in the storefront window at 2506 University Ave. to draw the attention of passersby and highlight the work of this unique creative community thriving in the Zone.